In my new found free-time, thanks to an ankle injury, I've been looking for new recipes to try out around the homestead. Thanks to Veronica, my IPhone, I found a great recipe for squash using the Whole Foods Recipe app. The application allows you to sort recipes by type (appetizer, main dish, etc.) or by special food need - a la vegetarian or vegan. It also lets you type in items you have on hand and brings back a meal that you could feasibly make. 1. Saute' onion and garlic in olive oil until onions just begin to soften. 2. Add squash and stir fry a minute or so. 3. Stir in stock and oregano and simmer until liquid has evaporated. 4. Serve, dusting with cheese and parsley as a garnish. The only thing that made me hesitant about trying this recipe was that there were no user reviews. Typically I find them pretty helpful. I halved the recipe, except for the vegetable stock. I actually ended up using more than 1/4 cup vegetable stock. 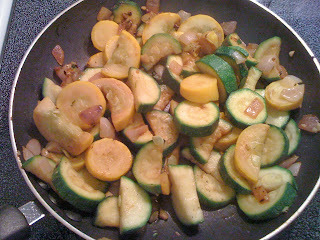 I had to add more because I cooked the zucchini and squash a little bit longer. (I'm not really a fan of crunchy veggies in a stir-fry) I also think that at least a tablespoon of oregano should be used. My 1/2 teaspoon was barely noticeable. Overall, it's a good recipe. I'll definitely try to make it again, just with more stock and spices to start off with.